Promoting your business can be a fun way to attract new customers and keep your name out there without breaking the bank, but with all the different ways of promoting and marketing your business it can be hard to choose the right application. Let the experts at Digigraphx help you make a wise and effective decision when promoting your business. We have over 15 years of experience in the promotional products industry and you can be guaranteed that you are going to get the best price and largest variety of options to help promote your business with us. On top of all that, we are very excited to offer you our exclusive and BRAND NEW LASER ETCHING technology. Your business can be on the cutting edge of retail fashion with your logo branded in such a way that your company looks cool. You can take advantage of this new technology in so many different ways. Give us a call to have any of your questions answered and let us explain what laser etching can do on fabrics and different materials. Watch this video for just a quick preview of what we can do and meet me, Tony, the owner and operator of Digigraphx. Our 100 WATT Laser Etching Machine has the precision and power to put your logo on so many new and different types of media all the while not breaking the bank. Laser etching can be used with material that is as hard as granite or as delicate as a water wicking golf shirt. 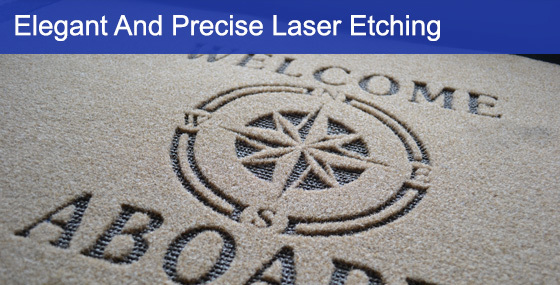 We can use laser etching to logo plaques, personalize car mats or engrave cutting boards for gifts. The possibilities are endless. The most common use of laser etching is we can put your logo directly into any polyester fabrics. The laser singes the material and actually burns the image into the fabric. This doesn’t damage the polyester, but instead you will get a great tone on tone effect that is permanent and won’t fade, wrinkle or crack. Also, we can now create logo and effects in hard to embroider areas like collars, sleeves and along zippers. You can use this on fleece jackets and even the super thin and lightweight water wicking material in golf shirts and sport apparel. The precision and effects are really amazing folks. This is something you need to see and touch to feel the impact of laser etching. 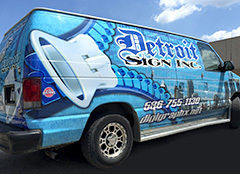 Stop by our Warren MI showroom and browse through hundreds of promotional products that you could use for your business marketing. Yes laser etching is a new and improved stand-alone promotional service, but it can also be combined with embroidery and other fabrics. We can create distressed looks and more crafty, hand cut and hand stitched ideas called appliqué. With our expertise in embroidery, multiple fabrics and this new laser technology, you will get a look that will be extremely hard for any other promotional products company to replicate. Our full service company will be able to provide you the best looking applique and reverse applique techniques.